^You definitely should. Now is the perfect time to catch up, if you liked Mass Effect 1 you are probably going to like number 2 and 3 as well. They are all great games and I'm currently playing all 3 again. Number 2 and 3 has aged very well too, they still look absolutely great. These games amazes me when it comes to how much content and story they have. Lots of likable characters too, don't know how many hours I've spent just walking around talking to crew members and listening to dialogues between crew members and random people. I'm also looking forward to X-com 2. Zero Time Dilemma, only a month to go now. I'm very excited about Detroit: Become Human by Quantic Dream, the same people who made Heavy Rain. No release date yet but release will likely be towards the end of this year or next year. Just like in Heavy Rain there will be several playable characters who can possibly die without a game over. The story will branch out depending on which choices are made much like in Heavy Rain, only this game is much more complex according to David Cage. PlayStation 4 Remote Play and Xbox One Streaming are services that allow you to stream your console content to your computer. It is free and only requires an app to be installed on the client computer or configuration between the console and Windows 10. Initially, the features suffered from lag and resolution degradation, but it has come a long way in the last year or so for both platforms. With a decent internet connection, you can stream and play games from your PS4 or XB1 with virtually no lag and only slight if any loss in resolution. What about the other way around? What if there was a way to stream your PC games to your Xbox or PlayStation? There will be soon. Rainway Inc. announced at E3 2017 that they would soon be launching a streaming service that will serve up games installed on your PC to other devices. The company plans on having native apps for just about every platform you can think of including PS4, XB1, iOS, Android, and even Nintendo Switch. Rainway has developed a software streaming solution it calls “MSG protocol” that can stream content from a PC with a DirectX 11 GPU to any other device with near lag-free fidelity. In addition to the native apps for each platform mentioned, the company already has its technology working in browsers. Essentially you will be able to play games installed on your computer from any device including other computers as long as you have an internet connection. Of course, there are a few catches. As you would expect, a fairly decent internet connection will be required. Also, it will not work with every title. When you install the app, it will scan your computer for compatible games. As of now, compatible games include Steam, Origin, Uplay, and BattleNET titles. However, the company says that there is a workaround for streaming non-compatible games. All you have to do is add the game to your Steam library in the options on your Steam client. The client will “pipe” the game through Steam and thus make it compatible with Rainway’s app. The service will go live on November 21, 2017, as a beta. At this time, there is no charge for the service. The company wants to use the beta time to “optimize” the service to be sure it runs as smoothly as possible across all platforms. It is unclear if Rainway will charge in the future, but it will likely seek other forms of revenue before looking to charge users. Those wanting to signup for the beta can do so at the Rainway website. While it's technically not a video game per se, I'm definitely looking forward to it. I'm really looking forward to Ghost of a Tale . Full release is March 2018 and it will be available on PC, Xbox One (Xbox version will release later than PC) and probably PS4. 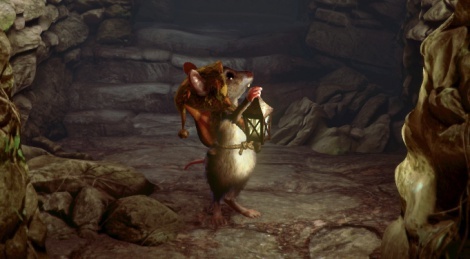 You can read more about it here: http://www.ghostofatale.com/media/ (link will take you to the media page with the trailer and some other cute pictures).